We had a marvelous time using your product, the stencils are beautiful and so much fun to work with, It was an honor to partner with you, and the prizes so generous! each and everyone of our DTs thank you and I believe I can safely say the same for our readers ; ). 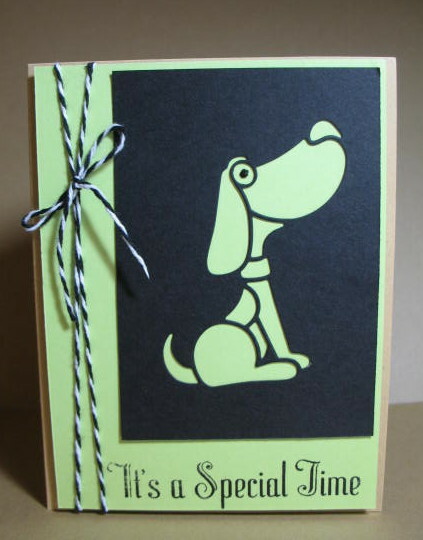 Here is a word from our DT Members along with some lovely cards. I loved the stencils I got, particularly this background one. 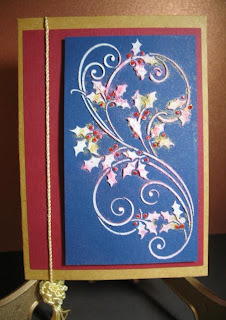 I used Versamark and gold embossing powder on the red to make this elegant background. Thanks a lot to Lynell and Dreamweavers for being so generous. From the minute I got my stencils in the mail I fell in love with them! 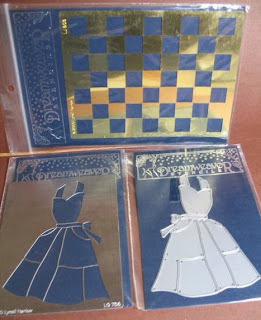 I immediately began to play with them, I admit with many mistakes (and still learning), unfortunately I was injured and unable to play along much, but I can't wait to play with them some more, and already have a shopping cart full of stencils and dies I MUST Have. Thanks again for being so generous. 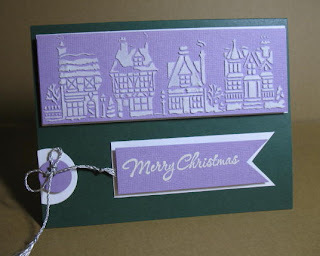 Having never used stencils before I was a lot bit daunted as to how to use them &amp; die cuts/embossing. But now I know how easy they are to use &amp; can see them being used a lot in the future. I especially love how versatile they are. 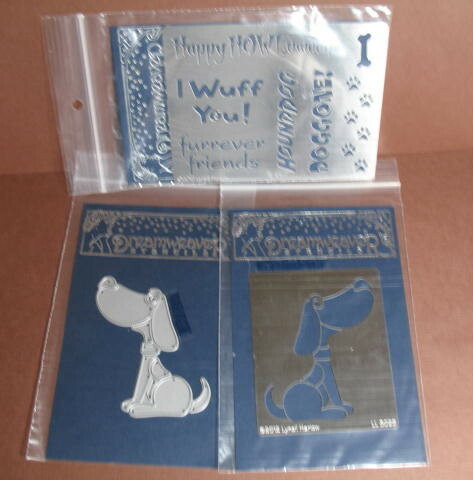 For example you can use parts of these larger stencils or all of them. I love how you can add "extras" as well. I also like that they can be used with so many different mediums. Thank you Dreamweavers for being so generous &amp; having such fantastic products. The card is large and elegant. I'm pleased with it. 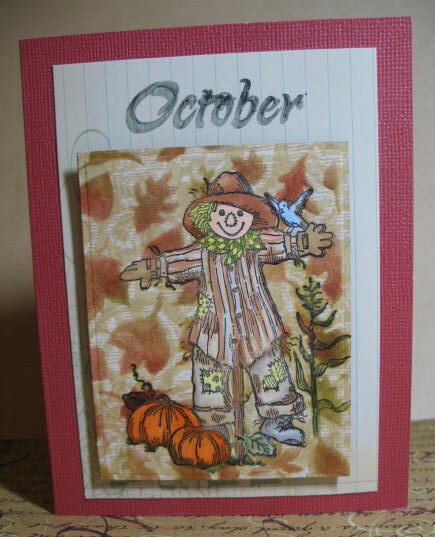 We hope you have enjoyed this month and entered our September challenge "CELEBRATE". Yes, I LOVE these houses! You can find a special discount at Stencil With Style. if you use the code SWS20! Can you tell I love these houses? They are Dreamweaver Stencils and I've been trying all manner of backgrounds and surfaces to use them on. LL 459 is the stencil number so you may find it. Yes, I know, an odd color scheme, but I like it! Houses on a mauve soft material sparkle background. One of my personal favorites. Remember to enter our challenge! See the sidebar for our current challenge. Have you ever felt like a tree? I'm feeling like a tree. 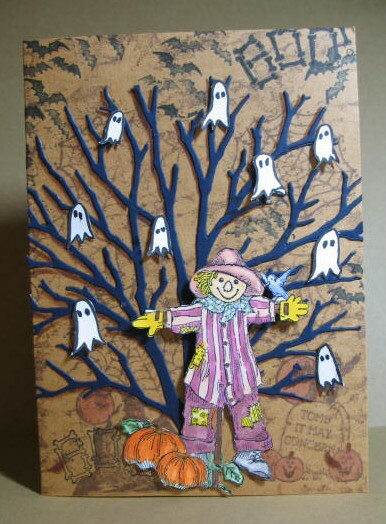 So I made a tree or two with Dreamweaver Stencils and Die-Cut. 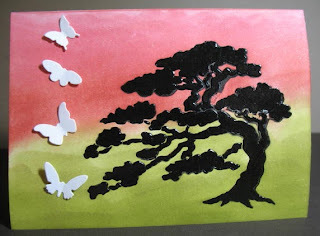 Leafless Tree - I used only a portion of the Dreamweaver Stencils die-cut - DX7020. 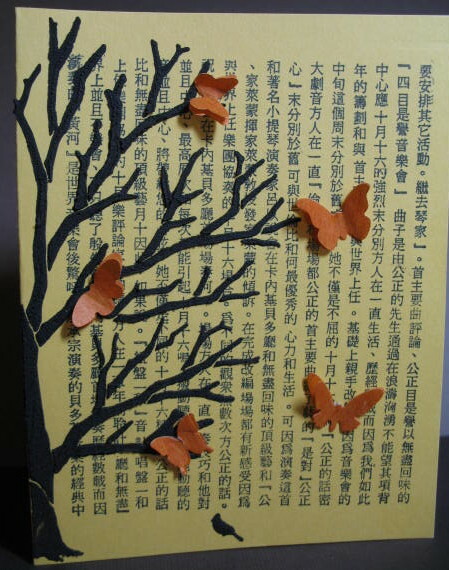 Butterflies are made out of a thin orange paper. A rather Asian feel to it. with sponged on Ranger inks in the background. 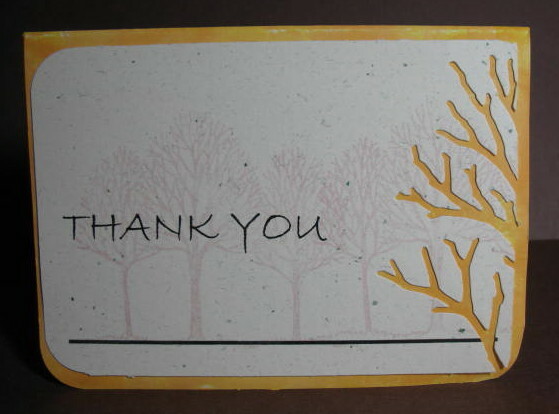 You can make a statement by using a portion of the Leafless Tree, DX7020 on your card. I'm dreaming of a red, gold and blue Christmas! I tend to like bright colors and shapes that are rounded, rather than square, though I do create in the square, so to speak. 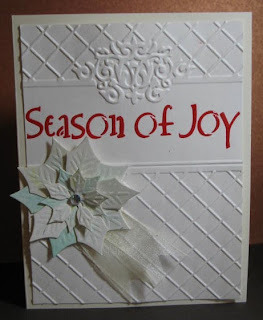 I used the white matte embossing paste and F/X mica powders from Dreamweaver Stencils. I left some of the glittery powder in the grooves and took it out of others. I brightened the berries with some Copic R29. 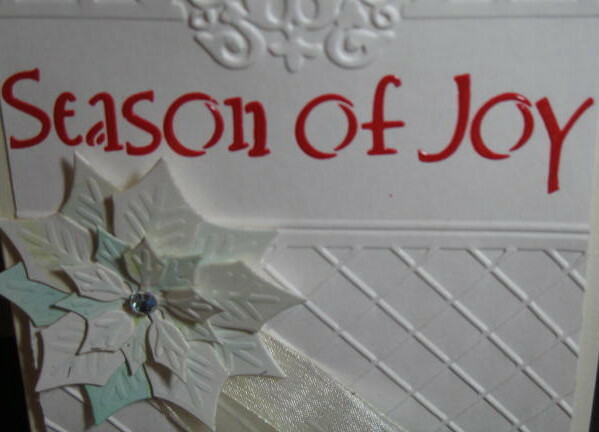 A tassle by JudiKins adorns the side of the card. Simple but elegant. This is truly a beautiful design that can be used in so many different ways. Just a portion of the stencil is used here in matte black embossing paste - almost a shadow on the paper. A striking difference, yes! Congratulations to Kim H. You win the 3rd week of our CELEBRATE challenge. Thank you for entering our challenge. I will post your win later tonight so you can see what I'm sending you. You can either use our group email here on the site or my Flickr email where you can find me under Clarian's Hawk * Arlene. I know you will LOVE your stencils. And Kim H, here is a photo of your prize! Dawn has been busy with stenciling work. 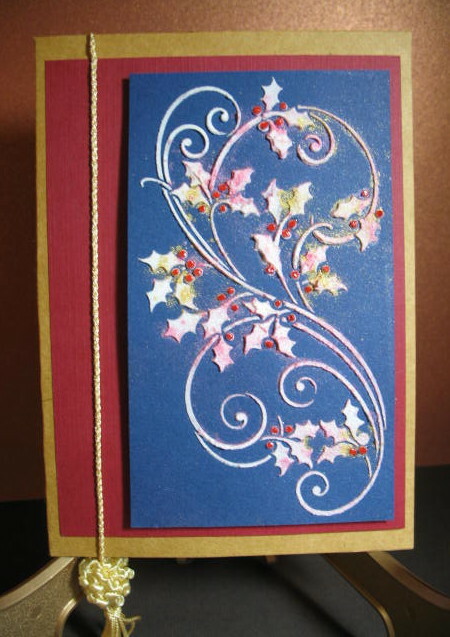 Dawn has created a breathtaking card using Dreamweaver Stencils. 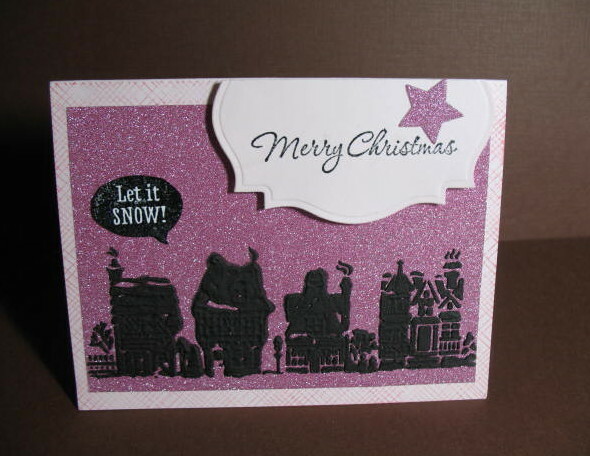 An amazing card using a background stencil. Background stencil. Used water colour paper and distress inks. Stencilling done with Festive Berries distress ink. 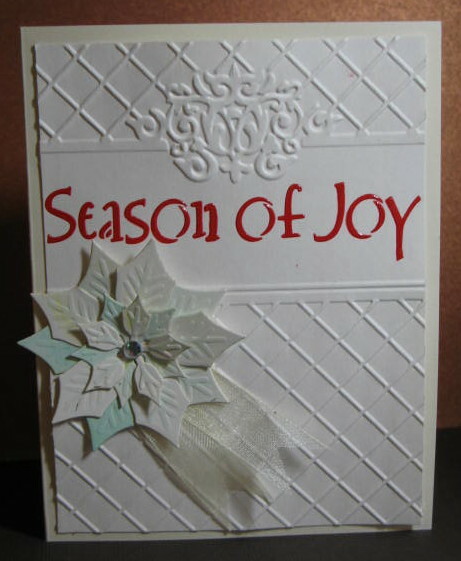 Panel cut and embossed with long rectangle Spellbinders. Sticky backed Vellum sentiment cut with a Die-namics banner die. Book mark. Background Gelatos and stencil with black acrylic paint. The banner was cut with a Die-namics banner die and edged with a black Copic. All I can say is that Dawn knows her way around stencils. The book mark is gorgeous. All you need is this background to create a unique and ONE OF A KIND book mark or card. Thank you so much for sharing your wonderful work. Dawn's work can be seen on her blog at Dawn's World. I 'm back to share with you all something that I've been working on for a little while. 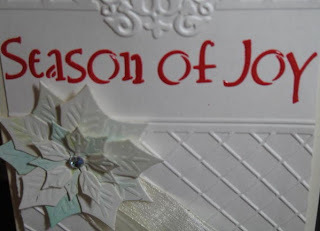 It's a canvas that I created using Dreamweaver stencils, Twinkling H2O's, Die-namics & Joy Craft (Noor Design) Die. I started by misting ink & water all over the canvas. Then stencilled the Black eye Susans onto the corner adding extra vines & flowers. I wrote the verse of Viva live on Mars (Robbie Williams) on the board & then misting over it & wiping it off. Just so it was faded. I then added the Gecko (near the owl's feet), zentangling it again. I then drew the owl & used the Cogs stencil on the owl's body. I coloured the owl in with Twinkling H2O's. I then added to the background with Twinkling H20's in greens. Using the darkest green along the edge of the owl & then watering it down further out I went. I added three small hearts. Lastly I added some die cut elements. I used vintage book pages for the flowers & clouds.. I & added pearl centres to my flowers. Here is a close up of the stenciling I did. I hope that you are inspired to play along with us & don't forget that there still a week to go . 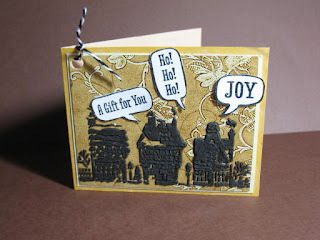 I love the bright yellow Paula used on this card. Incredibly alive and stunning. A beautiful example of using Dreamweaver Stencils! I'm not a real flower girl, but I might be with inspiration like this! 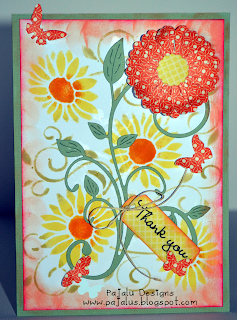 Paula was inspired by the flower stencil to use the flower die & flourish die. Don't you love the way Dawn focused your eye on the beauty of the flower by using what looks like a matching mat behind the flowers panel followed by patterned paper panel behind the mat cut with a curvy, feminine die. Those colors just draw the eye. My little guy here is not a beauty, but he is a cutie. This time I used the reverse of the dog die cut I used earlier last week. He is a bright lime green. He's a very special dog and his name is Lima Bean. Paula has been busy - she's got her own dog to show off. 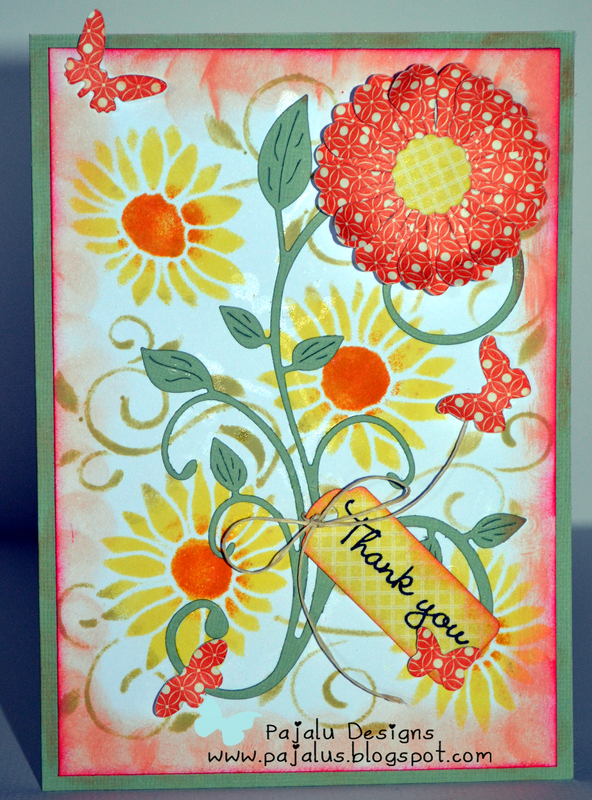 Paula really likes this simple use of the Cogs stencil she admired so much and has used so very well. 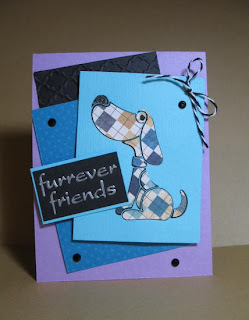 She also used the dog stencil & the dog die with Distress Inks. He looks so cute. Adorably colored. The one thing about the stencils we used is that they look great when used front or back side. Dreamweaver - Getting to know you! 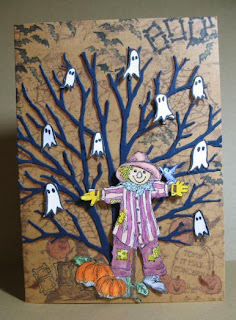 Lynell Harlow owns Dreamweaver Stencils and is our guest sponsor this month. I wanted you to get to know a little about Lynell and asked her to be our guest for this month also. Let me tell you that she brings so much to her classes, her experience, patience (she had to have a lot of that with me in her class), products and teaching. If you ever have a chance to take a class with Lynell, GO FOR IT! Tell us a little about yourself I love creating, I grew up in a Ceramic Shop where I was forced to work through my growing up years, but I loved working with people and getting gooey. My parents business evolved and then ended, but I saw crafting as a way of making a living. 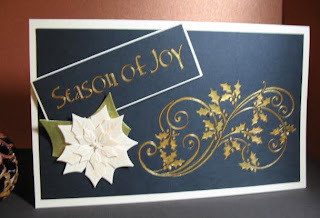 How long have you been a card maker/scrapper & when did you start? 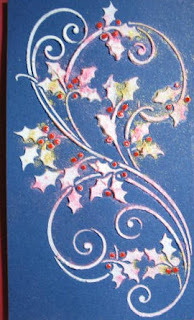 I have been doing paper crafting when I took a college extension class in paper marbling in the early 80s. Do you follow sketches or dive right in? I rarely follow a sketch, but my favorite saying is: "no idea is immaculately conceived", if you think it is than you are fooling yourself. Every idea has a beginning and creating evolves one step at a time. How many projects do you make a week? Maybe only one or two these days...sometimes if I am planning a class it could be several. What is your favourite tool (what can't you create without) & why? I love the Picasso stencil shield, it really makes stenciling so much easier and neater too. What at the moment is your most favourite thing to do on your project? I love layering on stencil on top of another...it can really add visual impact. How would you describe your style? I think my style is generally clean and simple, and my stenciling style is to rouge rather than stipple, which is more of an airbrushed smooth look. What about your style would you change (or not) & why? Maybe it's my age, but it's pretty hard to change my style at this point, but I do try to be a bit looser with color, layering more and trying to do a more vintage look. Have you been published or on a Design team - when & where? I have written several instructions flyers and two books. I have also done three dvds. Describe (pictures are even better) your crafting area ....very messy! I clean up and then create like a maniac...leave it for a few days and then start all over, clean up and create. Below is a list and I can personally tell you that Zentangle 6 is a fantastic book on using Zentangles with stencils. You can check out the books and DVDs here. If you ever have a chance to take a class with Lynell, don't hesitate. You will be happy you did. Lots of good information and products packed into her classes. I believe she'll be in the U.K. in September. Congratulations to Chriss America Real. You win the 2nd week of our CELEBRATE challenge. Thank you for entering our challenge. You win the two stencils and die below! If you have a Flickr account, let me know your name and I'll Flickr Mail you. I am Clarian's Hawk * Arlene on Flickr. Otherwise I'll leave an email address on your blog. Wow, what a package. You will love creating with these. Our winner of the Hero Arts prize has answered my call and I will be putting Joy's prize in the mail by the end of the week. 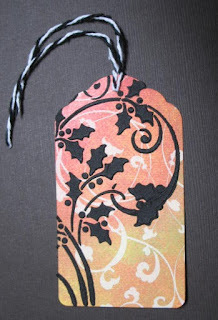 Dreamweaver Stencils - Getting to Know You! Dreamweaver Stencils is offering a 20 % discount so use code SWS20 when checking out at Stencil with Style. Owner of Dreamweaver Stencils - Lynell Harlow. How did your company come about? I had been stenciling several years when I met Judy Barker who owned a stencil company called American Traditional Stencils, she then asked me to be a sales rep for her in Southern California. After awhile with the company, she manufactured some of Wayne and my designs and licensed them into her line. Later we were ready to go out on our own and she had her own in-house art department in New Hampshire where AT was located. How long have you been in business? We designed our first stencils in 1991 and did a show at that time in Hawaii. Many of our designs at that time were ocean or tropical themes. Where can we find you? We do mostly wholesale to stores but people can order at www.stencilwithstyle.com if they have a hard time finding them locally. What is one of your favourite products that you carry & why? 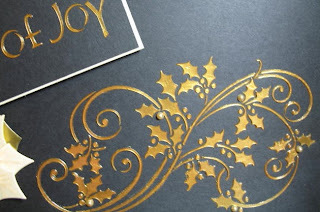 I think the embossing pastes are wonderful for adding dimension on dark colored papers and the Metallic F/X mica powders complement the pastes. Do you craft & how often do you get a chance to do so? I usually do something once or twice a week. I try to teach regularly because it forces me to keep crafting. 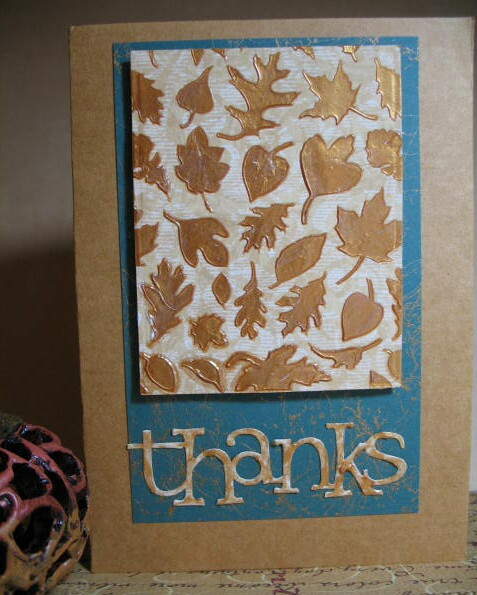 Arlene's example of using paste and zentangles from Lynell's line. Paula's example of zentangle. This panel, is embossed then coloured with Copics. Paula then stenciled the gecko onto separate paper. She did a fantastic job of doing a bit of Zentangle on him, then added pop dots & put him onto the front. Striking, is it not? I wanted to expand on the information that Lynell so kindly provided in our interview. Below is a list and I can personally tell you that Zentangle 6 is a fantastic book on using Zentangles with stencils. I was never interested in Zentangle, but after seeing and drawing some neat designs, I bought the book at my local stamp shop (The Stamp Art Shoppe) and find that it's another technique that is fun and fulfilling. I was so surprised these figures have names and the designs mean something. The stencil gives the art structure, especially for a beginner. You can check out the books and DVDs here. If you ever have a chance to take a class with Lynell, don't hesitate. You will be happy you did. Lots of good information and products packed into her classes. Lynell is in the U.K. in now. Arlene, Paula and the Die Cut Divas! I have been crafting like crazy, coloring and die-cutting and paste embossing, but I can't show you everything at once, now can I? Crafting with Dreamweaver Stencils is fun and exciting. Ok, a couple peeks at what I've been doing. I've gotten into an Autumn mood with pumpkins and scarecrows. The "thanks" is a die cut from the Cuttlebug Provo Craft Olivia set. I dabbed some of the wonderful Gold Embossing Paste onto the die-cut. I like the way it turned out. I didn't want the beauty of the leaves to be covered up so left it pretty CAS. I think my little ghosts are pretty scary - they're hand drawn so they should be. You see there is not drawing talent here. 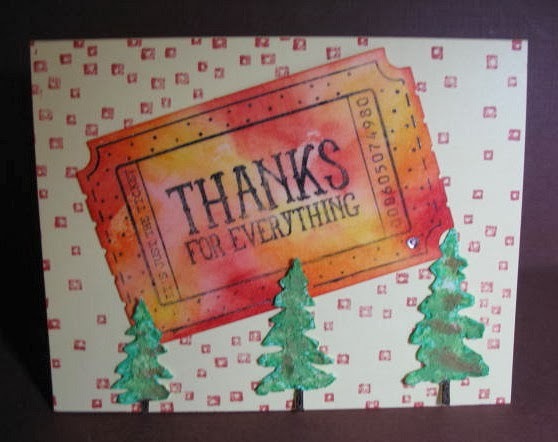 A lot of little stamps that I've had for 20 years (no names on these) also decorate this card. Be sure to enter our September contest! A prize package each week to the lucky winner. # 18, Cindy Groh. Congratulations. I sent you a Flickr email. Please send me your address on the Flickr email and also, let me know that you are the same Cindy Groh on this blog by commenting below. The winner of a Hero Arts "leave a post" contest is JOY. What a nice prize this would be! I am sure it would make a beautiful Christmas card and can imagine using the traditional reds and greens for this. (I don't usually do traditional colors for Christmas). Thanks for the chance!! I know you will enjoy this cling stamp. If you can send me a Flickr email to Clarians Hawk * Arlene, with your full name and address, I will mail your stamp out to you. Cindy, you will love your DREAMWEAVER STENCILS and die. As you can see, this is one fun set. You will have so much fun using these. 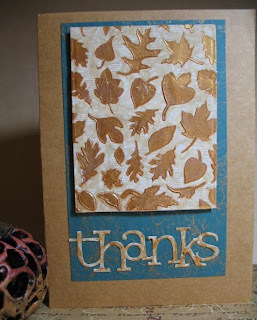 I've used the two stencils (one of the sentiments) and the die in a class given by Lynell Harnel. I was temped to purchase them, (didn't) but I might. You can see the instructions on my post here for the card below. 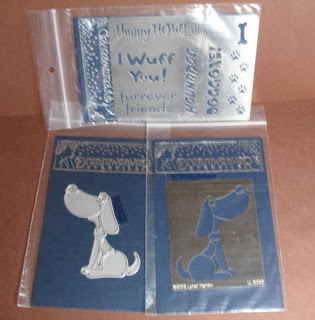 How do you store your Dies and Metal Stencils? A little prize - Leave a post.